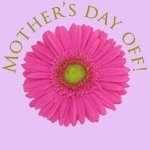 For fun, some of my Bento Blogger Friends decided to do a "Mother's Day Off" blog hop. So be sure to hop through and check out all the fun! Some kids made their own lunches. Some hubbies made the lunches. And some made lunches for MOM! Me: Do you want to come make lunch with me? Z: Yes. Wait. No. You make me a hot dog. Me: Okay. I can make you a hot dog. Will you come make me a sandwich too? Z: No. You can make a hot dog for me and a sandwich for yourself. Me: I would love it if you helped me. Z: *running off to play with dolls* No. You can do it Mama! So I enlisted my husband. He was excited about making a bento for me. Him: What do you want in it? Me: [I want a gloopy sandwich. And cheese mangled by my kid. And strawberries stabbed cut with a butter knife.] I dunno. You could look at my blog and see what I normally make. Him: A salad? Yeah, but is that what you want? So as you can see, I was totally helpful with the ideas. Garlic Chicken, brown rice, and Oreos. *swoon* He even got up early on Mother's Day, before heading to work, to whip up the Garlic Chicken from scratch! Be sure to check out what Crystal's family was up to on Crystal's Ramblings! Your husband rocks! I love that he put so much effort into it! That is one great lunch! OMG I am dying over here! I have fasting blood work this morning so I am starving...you garlic chicken has me drooling! LOL Hope you enjoyed your Mother's Day!! I am so jealous! Your husband is such a sweet man. I'm sure you had a grand time. Happy mother's day, mama!! What an awesome husband. It looks good to me and he obviously knows that all mommies need Oreos! Oh my that looks delish! Yum! Hubby did a great job. Yeah .... he's a keeper!